THE JEWELED FIRE: An Elemental Blessings Novel by Sharon Shinn is an impressively dull book about supposed intrigue at an imperial court as various potential heirs jockey to win the empress’ approval. Despite the characters telling us how cut-throat the competition is, A Hundred Thousand Kingdoms this ain’t — it feels more like a fantasy version of Friends (and not in a good way) with all the pretty young people hanging out, chatting, shopping and engaging in exposition (as everyone comes from different worlds we get uninteresting world-building discussions of how the different cultures differ). AVENGERS ACADEMY: Will We Use This in the Real World? by Christos Gage and Mike McCone has the academy students attempt to help out their teachers in various ways only to discover their efforts have gone horribly wrong when they resurrect the demigod Korvac. This was a fun sophomore volume (first one reviewed here), and the things I didn’t like are continuity they’re stuck with (I never thought the villain Taskmaster needed a tragic backstory, and I preferred Korvac when his goals were humanitarian rather than authoritarian). Good job. 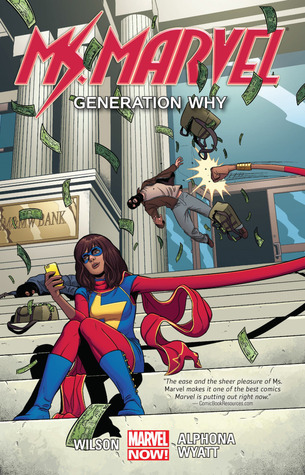 MS. MARVEL: Generation Why by G. Willow Wilson and Adrian Alphona (cover by Alphona, all rights with current holder) is also an excellent sophomore TPB (vol. 1 review), showcasing Kamala’s fan-girl personality when she meets Wolverine (“My story about you and Storm fighting alien monsters in space was the third most upvoted fanfic on Freakingamazing.com last month!”), and having fun with her fighting crime in Jersey City rather than the Big Apple. This shows Ms. Marvel growing into her role as a hero as she has to fight to protect her city, inspire her generation and gets a pet dog. A winner. THE SIXTH GUN: Bound by Cullen Bunn, Brian Hurtt and Tyler Crook has Sinclair and Becky journey with the guns to the citadel of the Sons of Abraham while Gord goes home to discover his dead family are in great shape. Unfortunately, neither defeat nor death stops the bad guys who are after the guns…and by the end of the book, the good guys are separated, alone and on the run. Entertaining as usual. SWAMP THING: Season’s End by Charles Soule and multiple artists worked better than I thought it would: while Machines vs. Living Things is one of the oldest cliches in SF, “the green’s” struggle against the new Machine Kingdom made for entertaining reading. This is very different in feel from any previous version of Swampie, less horror and more a kind of high fantasy with multiple warring magics (the kingdom of plants, beasts, fungi, decay …) but like I said, it worked. NEXUS ARCHIVES Vol. 3 by Mike Baron and Steve Rude (technically I read the individual issues rather than the bound collection, but so what?) has Horatio trying to reclaim his life from whatever entity sends him his dreams (we learn here that the nightmares involve reliving the death of every innocent Nexus’ designated target has committed), failing (“The entity has him in a tighter grip.”) and also dealing with the children he never knew he had and the fallout from having just whacked the president of Earth. Moving along nicely.